We are involved in the manufacturing, supplying and exporting of an array of Decking Sheets, which is known for its anti-corrosive properties. Widely regarded for its long lasting life, the offered range of decking sheets has amassed immense appreciations among the clientele we have accomplished to reap so far. Backed by our vast industrial experience, we have been able to offer a collective collection of Decking Sheets to our prestigious clients. Our professionals manufacture these sheets by quality approved raw materials and cutting edge technology. 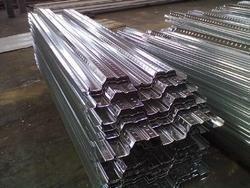 These raw materials are sourced from trustworthy vendors, who have been working with us since long duration. Offered sheets are widely demanded by our clients for their application oriented features like durability, heat and weather resistance and cost effectiveness. We offer these sheets in various dimensions.